Discussion in 'Army' started by maozedong, Feb 24, 2008. January 26, 2008, our school, "SG-III prototype device" one of the critical systems - "range photoelectric and control system" passed by the Chinese Academy of Engineering Physics laser fusion research center in Mianyang, Sichuan Province organizations acceptance. Acceptance Group by the 8th institute deputy chief Yeu Yong, director Zhang Xiaomin, deputy director Wan-Guo Zheng, director of 3nd department Xiao-Feng Wei,12th physics institute,Chinese Academy of Sciences Xian Photoelectric machinery institute units composed of experts .the project head engineer Lu Zhiwei, the Electrical and Mechanical College president LIANG Yingchun, Technology Services Department Deputy Director Zhao Hang members led more than 20 members of the project team participants. The group agreed that acceptance, our school projects through the use of group "based on the high-resolution conjugate of the target surface sensor target positioning and multi-beam footprint arbitrary precision guidance and control technology, based on advanced robot automatic target-shooting process technologies, as well as to triggered by the shooting range of optical and electrical machinery, such as centralized control of a comprehensive range of advanced control technology, "and to realize the beam guide loop, targeting process procedures, and data management automation, with the ability to conduct physics experiments. A prototype device, as well as two two-year trial run physics experiment examination, and its main properties and technical indicators have reached the mandate of the Association and the contract requirements, it was agreed that the project through acceptance. The project brings together space flight academy, and the Electrical and Mechanical College, the Institute of Electrical and a number of units of the interdisciplinary, cross-disciplinary research team, I participated in school and long-term national science and technology development planning one of the 16 major projects. Along with "SG-III prototype optoelectronic devices range and control system" acceptance "Shenguang III mainframe range optoelectronic devices and control system" smooth passage of a pre-assessment for the next phase of the work to lay a good foundation. 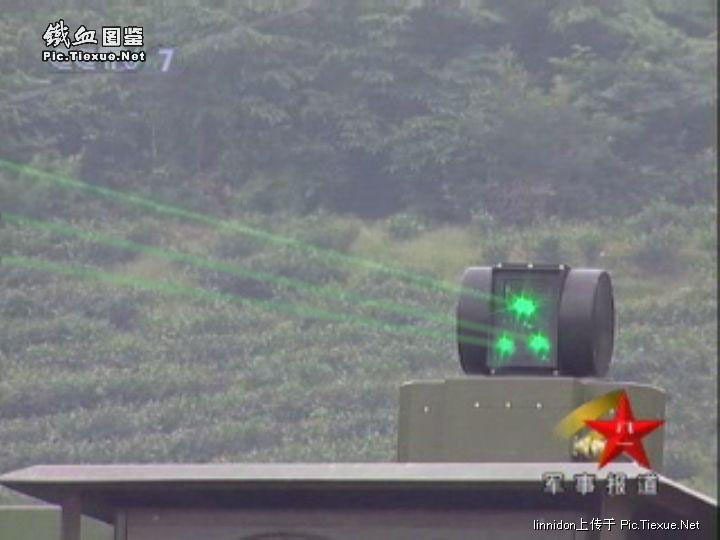 Does anyone have any pics of Chinese Lasers, or info on the ones allegedly used to dazzle satellites? Here's a JDW extract of Chinese laser weapon development. Interesting that it talks of a chemical laser DESTROYING a drone in 1999..
Not sure how reliable the extract is though. Here are some pics that appeared recently. Not sure if they're actually weapons or just for training but the caption where I got them said they were lasers. By the gear it looks like laser tag. Maybe someone has more info. A-Mace..I thinks it's just Laser Tag. Look at that girl in the first picture. She's does not look military to me. And does the PLA have mixed male & female forces? Don't think so. These sort of game equipments have been on sale for Chinese kids 10 years ago, with a range of 50 - 100m and each participant wear a receiver for the light beam. The military version may have better performance but its just for training. Yes, the first pic definitely looks amateuristic. The second pic... one is actually is holding a weapon. Last I heard all college level students have to take a semester or two in some military training. Maybe like ROTC. Someone might clarify on that one. Post Tiananmen Square protest I remember the government forced all the students into the program early. I was pretty much a skeptic on this Chinese laser gun until I saw how simple you can turn your maglite flashlight into a laser that can do damage pretty much as described for the Chinese laser gun. With some modifications you can probably field a simple laser that can cause some damage on the enemy in the field. lasers are deadly and impossible to stop, i heard many young teenagers got in trouble for shining them at people. An adult was even sent to jail for shining it at an commercial airplane in high altitude. In a short period it had caused temporary blindness and light permanent damage. Last I heard all college level students have to take a semester or two in some military training. Maybe like ROTC. Someone might clarify on that one. Post Tiananmen Square protest I remember the government forced all the students into the program early. I think most of first-year college students get one to two months of training before school starts. And it's mostly discipline type, marching and sorts. My wife went through it when she went to college in China. They got to shoot a whopping 5 bullets at the very end of the training. And it was mainly for entertainment, kind of a reward for their hard work. After the Tiananmen square incident, only students getting in Beijing University had to go through training for a full year. And I don't think they still do it now. Not only is the Chinese military advancing rapidly in the field of anti-satellite, anti-missile laser weapon technology, but its technology equals or surpasses U.S. laser weapons capabilities currently under development. Draw your attention: "Countering the Rise of Chinese Private Military Contractors"